Offer expires March 28, 2017 11:59pm (EDT). Please call 1-800-852-4216 for complete details. 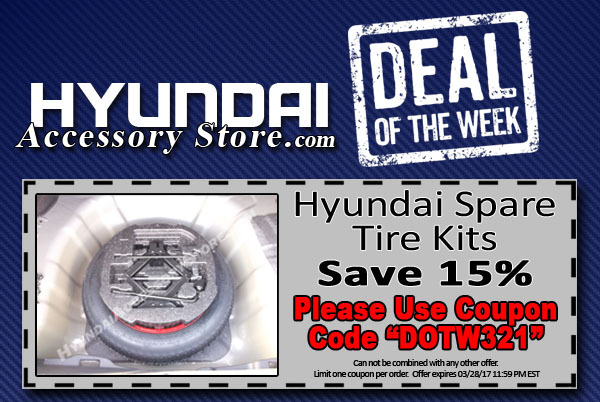 This entry was posted in Hyundai, Hyundai Accessory Store on March 21, 2017 by Josh. Hello, I bought a New Hyundai Elantra Value Edition from Glassman Auto Group. Tom Kalmeta sold the car to me. Someone at the dealership told me about coupons or discounts on accessories. Tom interduced me to several people including the service and parts departments. I also spoke with the financial person. So I don’t remember who it was. I want to order mud guards (all 4) door wind guards (all 4) and a sunroof deflector. When I went to total my cart up from Glassman Auto Group accessories it ask me for coupon and pin number. I don’t know where to get that. I emailed Tom and ask him to get with me on Monday. We are not affiliated with Glassman Auto Group. However we are a Hyundai dealer and I can get you any part you need. Please visit our store at HyundaiAccessoryStore.com. There is an 11% discount for new customers. You can also call us at 1-800-852-4216.
where do I find the coupons for accessories for my 2017 Hyundai Elantra Value Edition?